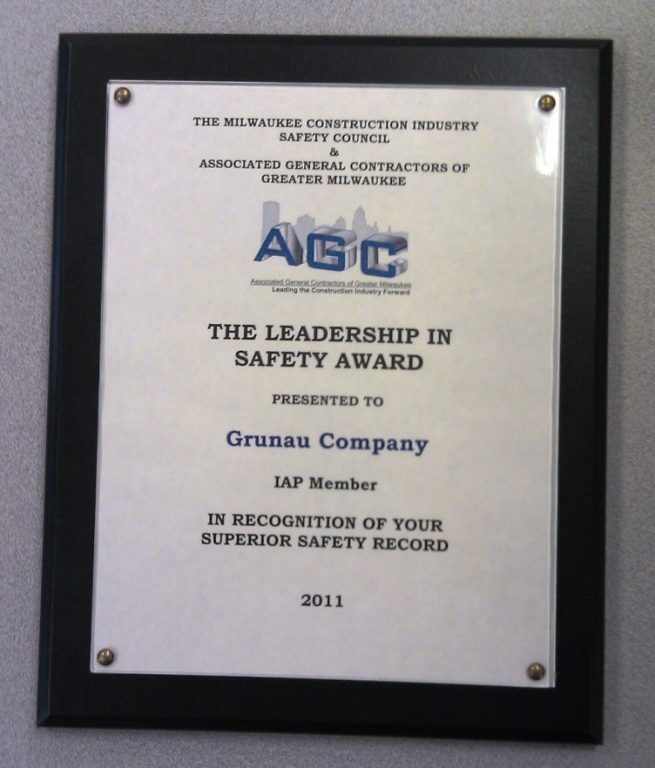 Leadership in Safety Award from AGC | Grunau Company, Inc.
Grunau was awarded the Leadership in Safety Award from the Associated General Contractors (AGC) and Milwaukee Construction Industry Safety Council (MCISC) in recognition of our superior safety record in 2011. Our safety record includes a low EMR as we pay close attention to our claims to minimize costs. We also practice an aggressive light duty policy, focusing on a person’s abilities rather than their disabilities. We bring construction field personnel into our shops or office to perform light duty tasks when warranted. This practice has been statistically proven to mitigate days away from work while providing meaningful work to employees so they regain their health faster and receive full pay instead of a worker’s comp partial pay. Grunau recognizes that OSHA and the industry analyzes safety based on statistics but we focus instead on our people. By making sure our people are safe, then the statistics follow in the correct trend. This award demonstrates that other organizations are recognizing Grunau’s drive for professionalism in safety. Furthermore, this award celebrates all our employees who are involved in Grunau’s strong safety culture.